Is there a way to simulate a vehicle mass separation at impact? Go to Create > Physics > Stop Simulation to turn off the physics simulation. This will make our work a little easier. Go to the faces menu in the left side control panel. Press the "detach" button. This tells Virtual CRASH to separate the polygons that you've selected from the rest of the truck's body. The polygons for the bed will now become a new mesh object. Change your selection type back to Object (press Shift-O). Note, if we wished to separate the cab from the frame rails of the truck, we would have selected the cab's polygons and detached them rather than the bed's polygons. Next, you'll need to make the bed polygons into a rigid body object. Select the bed, and go to Create > Physics > Make Rigid Body From Selection. You're now going to need to set the cg position and inertial properties for the bed and the cab sections of the vehicle. With the cab object selected, go to the Pivot selection type (Shift-P). This will reveal an axes object whose origin corresponds to the object's cg location. Restricting movement to the x-axis (press the "1" key), you can slide the cg point backward. Use the Restrict to Z option (press the "3" key) to modify the vertical position of the cg. Repeat this process fo the cab, which will have its own cg. Don't forget to modify the inertial properties of the cab and bed separately to reflect the fact that these are two separate rigid body objects. By default, when a mesh object is turn into a rigid body object, the "default-auto" model is used. But, in this case, since the bed is simply a part of the original pickup truck structure, we're going to change the contact model to Kudlich-Slibar. Simply highlight both the bed and cab objects, go to the contact menu, and change preferred to "kudlich-slibar." Now we basically have two separate rigid body objects directly next to each other, but not connected. We'll need to connect them using joints. 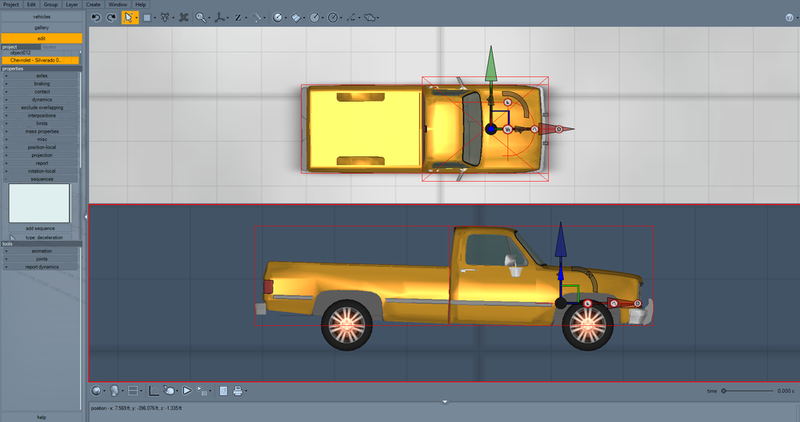 Let's first group the two objects together to make it easier to move the truck around our scene. Hover your mouse over a portion toward the rear of the cab. The cab should turn light blue. Left-click and hold, and then drag your mouse cursor over a portion near the front of the cab. The cab should turn light blue. Release your mouse. You should now see a joint object which connects to the two objects together. Let's do this three more times. We'll put two joints on each side. You can be more precise with your joint placement by using grid snapping, but we're not going to worry about that here. Remember, like any other object, the joints can be hidden by using the hide option in the project menu in the left side control panel. Grabbing the group object, you should be able to reposition and reorient the cab and bed together. Select all of the joints. Go to the properties menu, and under contact, select "disable before brake." This will prevent the bed from colliding with the cab before the joints have been broken. Now restart the physics simulation by going to Create > Physics > Stop Simulation. Confirm that there are no issues with the cab and bed reaching static equilibrium when you restart your simulation. Select both the cab and bed, and set the initial velocity for the system. They should move together. Select all of the joints. Notice in the left side control panel, the joint menu contains a setting for joint spring stiffness and damping. Each joint is modeled as a damped oscillator. If you notice the bed of the truck is sagging away from the bed, increasing the spring stiffness coefficient should solve the problem. Next, we're going to spontaneously separate the bed from the cab by breaking the joint connections. Joint connections can be broken as a function of force, torque, or time. You'll find that using time is the fastest way to accomplish this since using force or torque require some knowledge of breaking threshold values. With all joints selected, enable the "use time" option under breaking. Here we'll break all four joints at time = 1 second. You'll notice the bed begin to fall downward, acting as a free rigid body object, after this time. Now that you've mastered this process, you'll see just how easy it is to synchronize the joint separation with your collision event. Set up your collision, and adjust the separation times for your joints until you get the desired result. Again, breaking force or torque thresholds can also be used. You should experiment with all of these options. Tags: Vehicle splitting up, separating mass, severed vehicle, split vehicle.